I’ve been geeking out about Arabic music a lot in the last year, including listening to a lot of different things, reading loads of books, and even learning to play the oud. And in that time, I’ve realised that there’s a bit of misunderstanding of muwashshahat (singular muwashshah) in the bellydance world. Muwashshahat are songs that come from mediaeval Islamic Spain (Al-Andalus), and have survived to the present day. They use the 10/8 Samai Thaqil rhythm. Originally, court dances may have been done to them, but nobody really knows what these dances looked like. These dances were creatively reimagined in the 20th century by Mahmoud Reda and Farida Fahmy, and this is how we dance to muwashshahat today. I’ve come to realise that this information is not exactly wrong as such, but it is very incomplete, and somewhat misleading. So, what actually are muwashshahat? The term muwashshahat actually refers to a poetic form, which originally became popular in al-Andalus. There are several musical traditions based on this poetic form. These include the North African ‘Andalusi Nuba’ tradition (which we don’t tend to dance to, and which I don’t know a great deal about), and the Syrian/Egyptian wasla tradition which incorporates muwashshah poems set to music, along with other instrumental and lyrical genres. The pieces we use for dance come from the Syrian/Egyptian tradition. Some of these use old poetry from al-Andalus, whilst some use more recently composed poems in the muwashshah form. However, the musical compositions themselves are not from al-Andalus. For example, Lamma Bada is the best known muwashshah. The lyrics are thought to be very old, but the melody used today was composed in Egypt in the 19th century (see 004 – Sama‘ – Lammā badā yatathanna – AMAR Foundation for Arab Music Archiving & Research for more info on this song, and some very early recordings). The compositional style was influenced by Turkish instrumental forms during the Ottoman period, particularly by the Turkish samai. Lots of Egyptian muwashshahat were composed in the 19th century during the nahda or Egyptian rennaisance, and some in the early 20th century too. The great Egyptian composer Sayyed Darwish wrote several, for example. They are an important part of the Egyptian musical tradition, especially before the advent of the ughniyah or ‘long song’ format of Oum Kalthoum et al. Legendary singer and composer Mohammed Abdelwahab recorded many muwashshahat during his early career. More recently, a huge number of muwashshahat have been recorded by the Syrian singer Sabah Fakhri. A variety of rhythms are used in muwashshahat – 10/8 samai thaqil is certainly popular, but it’s not the only one by any means. Other muwashshah rhythms include familiar favourites like masmoudi kebir, as well as many based on longer rhythmic cycles which are almost never used in dance. There’s a fairly exhaustive list of these rhythms here, including audio clips – Maqam World – Muwashshah Rhythms. It’s also worth noting that they are not all slow, and some are actually very lively. Even Lamma Bada, which is often played very slowly in recent recordings, was originally far more upbeat! So, what about the dancing? In these dances he was not restricted to any specific temporal reference or dance tradition. This gave him a wider range of movement and choreographic possibilities. In his choreographies, Mahmoud Reda relied on his artistic imagination and how the music inspired him, as well as his expertise and rich repertoire of movement vocabulary that he had accumulated for many years. We can therefore see that it is, essentially, a fusion style, albeit one developed in Egypt for an Egyptian audience. However, muwashshahat were, at one point, the popular music of their day, and it’s reasonable to assume that dancers would have performed to them in the 19th century (although there were other types of music more associated with dance, e.g. light songs in dance rhythms, and the tahmila, a structured improvisational style). Egyptian films, especially when portraying 19th century scenes, sometimes show dancers performing to muwashshahat in styles not influenced by Reda. So, if you choose to dance to muwashshahat, it’s legitimate to use the Reda style, but it’s not mandatory. Reda’s interpretation was a fanciful re-imagining, rather than a historical reconstruction. There’s certainly precedent for dancers interpreting these beautiful pieces of music in their own styles, and so I think there’s also a place both for trying to recreate the style of the late 19th century, and for applying your own original interpretation using your knowledge of present-day Egyptian dance, as well as for the Reda style. Al Muwashshah – AMAR foundation podcast – a more detailed and technical look at the history of the muwashshah as a musical form, including historical recordings. Podcast in Arabic, with transcript in English. Farida Fahmy – Dancing Muwashshahat – Farida Fahmy writes about the development of the Reda troupe’s muwashshah style. Among the Jasmine Trees: Music and Modernity in Contemporary Syria – Jonathon Holt-Shannon – A more detailed look at the musical traditions of Aleppo in Syria. This post is part book review, part essay, and part personal reflection. This week, I finished reading the excellent “Making Music in the Arab World: The Culture and Artistry of Tarab” by A.J. Racy. This book has been on my ‘to read’ list for a long time, and I was finally spurred on to buy myself a copy by a discussion with one of my close friends on what makes singing emotionally moving, or makes it inspire a state we might describe as tarab. Tarab (طرب) is a concept that has no exact translation in English, but which describes a state of enchantment, rapture or ‘musical ecstasy’, inspired by certain musical performances. Many bellydancers are aware of this concept, and many talk about achieving a state of tarab during performance, but I suspect that few (myself included) fully understand it. I have been deeply interested in the experience of tarab since first learning of it some years ago – I have always been fascinated by and drawn to ‘mystical’ experiences and other states of consciousness, a personality trait which I am told is common in dancers, although it doesn’t always sit comfortably with my own rationalist worldview. Reading “Making Music in the Arab World”, I had several “Aha!” moments regarding the nature of tarab, and why certain music makes me ‘melt’ whilst other recordings leave me unmoved. But I was also left with the feeling that I was barely scratching the surface of an incredibly complex and nuanced musical world. Although I have a good working knowledge of Arabic rhythms (which I now know are called iqa’at (ايقاعات)), as is essential for a good dancer, I have only the faintest passing acquaintance with the Arabic modes, or maqamat (مقامات). This isn’t a problem as a dancer, per se (in fact, one teacher for whom I have a great deal of respect, and who shall remain nameless, once poked fun at me for over-analysing when I asked a question about maqamat in class). Understanding maqamat would be unlikely to make any material difference to my dancing. But I now believe that not understanding them limits the level at which I am able to appreciate or enjoy classical Arabic music at the moment – and the more deeply I can feel and connect with music, the more that my dance is able to ‘flow’ without conscious input. Plus, dance aside, I would like to experience this music as fully as I’m able to, purely for my own enjoyment. Racy explains that for both musicians and tarab listeners, a deeply internalised familiarity with the maqamat means that each maqam has its own feeling or ‘colour’, and its own distinct ability to create a feeling of tarab, or in the case of musicians, saltanah (سلطانه), which is a state of musical inspiration described by Racy as ‘modal ecstasy’, and which seems similar to what we might describe as a flow state. An educated listener (i.e. not me, at present…) can appreciate when a maqam is explored by the musician in a satisfying or clever way, when an unexpected note or phrase is used, or when the musician successfully modulates to another maqam – and can apparently thus derive great enjoyment and tarab from a good taqsim (solo improvisation). In this area, I feel like I’m missing out on a lot. As it happens, I recently decided that my new challenge for this year was going to be to learn to play the oud (Arabic lute), since for a long time I played classical guitar, and I miss being able to create music as well as dancing to it. So now, my determination to do so is doubled, as I now see that learning to play and recognise maqamat will have many benefits for me, even if I never become a good, or even competent, oud player. So what *is* tarab anyway? And how do we get there? Conflicting emotions, such as love and separation, joy and sorrow, are brought together into a ‘bittersweet’ emotional state. A stylised lyrical theme of love and longing is both something that most people can identify with, which creates the intense conflicting emotions described above, and a metaphor for a love of the music itself. Musical looseness of timing (i.e. not rigidly following the underlying rhythm), especially on the part of the singer (who can choose to stretch out syllables, ornament melodies, and alter timing), creates a powerful tarab effect. Everybody involved in creating music, including the poet who writes the lyrics, the composer, and the musicians and singer, should ideally have a strong emotional connection to it, which is then reflected in the music when it is performed. Back-and-forth interaction between musicians and listeners, and a good atmosphere, are essential at a live musical event. Rasha with a live Arabic band. A general feeling of heightened emotion, with something of the bittersweet character described above, sometimes combined with a certain awe for the musician or singer who has created such beauty. A sensation of ‘melting’ or being ‘in the music’, in which the music fills my awareness and it is difficult to pay attention to anything else – in this state, if I am dancing, dance often becomes natural and effortless. Feeling the music within my body, as if my heart were rising and falling with the melody. In the musical passages that tend to have this effect upon me, I can see many the elements of tarab that I mentioned earlier. Almost all of my favourite Arabic songs have a theme of love, loneliness and (sometimes enjoyable) pain, which I find both moving and evocative. As a particularly unambiguous example, from ‘El Hawa Sultan‘ by George Wassouf, a song which I find very beautiful and never tire of listening to: “albi b3azabo kteer farhan” – “in her torture, my heart is joyful”. Or a more nuanced example of melancholy from Umm Kalthum’s powerful ‘El Hob Kolo’: “tariq hayati mashi qablak fi lail tawil; la qalb gambi ya7asibiya w la teyf gamil” “I walked the road of my life, before you, in an endless night; No heart beside me to feel me, nor any beautiful specter”. Of course, having the right words isn’t enough, especially since I know very little Arabic and mainly rely on translations. The singer must also be able to imbue the lyrics with real emotion, which doesn’t rely upon the words to take effect. Now I’m aware of it, I can also hear that the musical passages which tend to create a feeling of melting into the music are those where the singer or instrumental soloist works loosely around the rhythm, and stretches and embellishes the melody. I now know that this technique is known in Arabic as tatrib – the art of producing tarab. More effective still are the rhythmless mawawil (singular mawal), vocal improvisations which I have increasingly come to enjoy recently, although in most cases I do not dance to them or find them appropriate for dancing. Racy also describes an altered perception of the passage of time as a common part of the tarab experience. I can’t honestly say I have experienced this myself, but this is probably in part because I rarely have the chance to attend live concerts, where this is more likely to take place, and generally have to settle for recorded music. I’m aware that at least some of you reading this will probably be bellydance students who haven’t yet got that ‘into’ Arabic music (in which case, well done if you’ve made it this far!). So you might be feeling a bit overwhelmed or bewildered by the amount of information and specialist musical terms, or wondering why you don’t yet feel this special connection to the music that you hear in class or use for practise. Appreciating Arabic music as a Western dancer is a rather gradual process, in my experience. It takes a lot of time and repeated exposure to get a good feeling for the rhythms and the unfamiliar melodic structure. To begin with, you will most likely feel more drawn to music with a simple structure or a lot of Western pop influence. The appeal of more complex music will gradually grow as the basic features of Arabic music become more familiar to you and start to seep into your subconscious. And with each step you take down that rabbit hole, the way ahead of you will be lit a little brighter, and the next step will become a little more inviting. So it is that when I took my first bellydance class, I loved the Westernised fusion pop of Natacha Atlas, and when I first heard a recording of Umm Kalthum, I found it strange and inaccessible, and her voice austere and offputting. A little over five years later, after many small steps into the musically unfamiliar, and an hour-long live recording of Umm Kalthum can send shivers down my spine, although I still find it a little easier to lose myself in the deep, velvety voice of Abdel Halim Hafez. And poor Natacha now languishes, unlistened, on my CD shelf. This is an continuing journey, of course, and there is still a lot ahead of me – a lot of music that is loved by tarab aficionados, which I do not yet ‘get’. I may never ‘get’ all of it. Learning about the maqamat is another step on the journey, as is listening to music that I can’t fully appreciate yet, knowing that in time its beauty may reveal itself to me. I’m also pretty sure that some of this depends on your personality and natural response to music. In “Making Music in the Arab World”, Racy speaks of a widespread belief among Arabs that response to music is innate, and that some children naturally become fixated on music (and may go on to become musicians or music lovers) whilst others are indifferent. This fits with other things I have read on musical response – some people simply do not derive any pleasure from music at all (about one in twenty, apparently), whilst others may enjoy some aspects of music but not others, or respond with a more straightforward enjoyment of rhythm and melody rather than the complex trance-like/ecstatic state of tarab. So although this is a path of musical appreciation that I feel drawn to, you may find after some experimentation that your own musical direction or interest takes you elsewhere. This has been more of a rambling essay than a review so far, so to finish, here’s a little more on the book itself. Although it’s an academic work, I found it perfectly readable most of the time. There are some sections that go into a fair bit of technical detail on maqamat which you might want to skip if you have no knowledge of musical theory, but most of the content is remarkably accessible and clearly written. I actually found this so interesting that I could hardly put it down, and would have read it all in one go had time allowed – as a dancer with a strong interest in music, it came as a series of revelations to me. The chapters cover the social context of tarab music, some of the technical details of how this music works and what aspects of it create the powerful effect it has upon listeners, a detailed look at the lyrical themes including many examples of lyrics and translations, and a fascinating overview of what defines tarab and tarab music. There are many invaluable insights from interviews with musicians and singers, as well as the author’s own experiences as a tarab musician, which give him a unique view of the subject. So basically, if you love music, and are OK with books that are a bit academic in tone, I definitely recommend this. It’s going on my mental list of essential reading for the thoughtful bellydancer (along with Karin Nieuwkerk’s “A Trade Like Any Other”). In Love With Music – my previous post on musical appreciation. The great thing about learning an art form from another culture is that it can be a gateway to appreciating a culture other than your own. It can help you to see the world from other perspectives, and learn to see people from that culture as three-dimensional individuals, instead of through the stereotypes we grew up surrounded by. When this happens, and we break down our own barriers of misunderstanding and prejudice, I believe that in a small way, we make the world a better place. Whenever discussions of cultural appropriation come up, in the bellydance world, “it’s not appropriation, it’s appreciation!” is one of the first defences dancers reach for. And if that’s true, that’s great. But as with anything, we shouldn’t just assume it’s all fine and continue on our merry way without looking any closer. When we say this, are we really deeply appreciating these cultures and developing understanding? Or just borrowing superficial things from other cultures because they look pretty, and then dressing it up as a noble act so we can feel good about ourselves? The answer, of course, is “it depends”. It depends on how we see the dance, how we engage with it, and how we engage with the culture it’s a part of. The dance itself – This might seem like a no-brainer, but do you enjoy watching Middle Eastern* dance, and seek opportunities to watch good dance? Not just your friends dancing at haflas, but professional-quality shows, DVDs, YouTube videos? Do you enjoy watching videos of dancers from the countries of origin? In other words, do you appreciate bellydance itself as an art? Or do you find it boring unless you’re participating? The cultural connection – Do you see bellydance as a cultural dance rooted in certain parts of the world, that comes from the social and performance dances of real people in those places? I would argue that for bellydancing to be a form of cultural appreciation, this is essential. Do you think bellydance is any dance that uses a certain set of basic torso isolations? Or do you think it is more than that – including ways of interpreting music, of relating movements to each other, of communicating with your audience, that are all deeply entwined with the cultures the dance comes from? The history – How much do you know about the history of this dance form, and where did you learn it? Do you value reliable, first-hand sources and evidence, or are you happy to believe origin myths based on wishful thinking and Orientalist stereotypes? Shira wrote a great article on identifying reliable historical information, which I do suggest you read if you haven’t already seen it, as well as an article examining popular bellydance myths. If you want to appreciate Middle Eastern cultures, it’s important to look for the reality of those cultures, and how this dance developed as a part of them – and not let the real people who shaped the dance get lost in a cloud of romantic fantasies about the past. The cultural background – Do you take an interest in aspects of Middle Eastern culture, language, history and current affairs that aren’t directly related to dance? Do you read books or blogs about Middle Eastern history, arts, pop culture, or daily life, or by Middle Eastern writers? Keep up to date with news from the region? Visit exhibitions of Islamic art when they happen locally, or go to concerts or cultural events even when they are not directly aimed at or organised by bellydancers? Watch films or documentaries? Or even take language classes? Of course, I don’t expect anyone to have the time and money to do all these things at once, but I’d expect anyone with a real appreciation of these cultures to have at least taken an interest in a few of them. Now, I don’t know what your answers to those questions are. And I’m not judging you as a person or as a dancer if you answered ‘no’ to any of them. They are just for you to reflect upon, and work out where you stand (and where you’d like to stand). It’s possible to be a beautiful, entertaining dancer without being very interested in Middle Eastern cultures – but if that’s the case, you do need to be aware that claiming to ‘appreciate’ those cultures purely by participating in bellydance may ring hollow. So when the question comes up of if/when it’s ethical for us to represent another culture, as inevitably it will, you will need to find your own way to square your involvement with the dance with respect for the original cultures and for the people who dance this dance because they grew up with it. It’s not a question of Tribal vs. Oriental either, because I know dancers in both camps who are seriously knowledgeable about the dance’s origins, and also those who move beautifully but do not have much interest in the deeper roots or wider culture. In either case it’s up to you to think carefully about this stuff, and work out your own answers. And of course, it’s normal for your level of cultural appreciation to change throughout your life as a dancer. Many of us come to the dance with little knowledge of the Middle East, and holding some questionable attitudes about people from that region that we’ve picked up from our popular culture. The wonderful thing is that the curiosity inspired by learning a cultural dance can change that. If you’ve only been dancing for a short time, please don’t feel put off by this post. It takes time to learn and develop your understanding, and it’s OK to learn at your own pace, as long as you’re interested and open to learning. Think of these questions as suggestions for your dance education outside of class (although a good teacher will also include some of these things in class). A Trade Like Any Other – female singers and dancers in Egypt, by Karin Niewkerk. I cannot recommend this book enough! You Asked Aunt Rocky – Advice and answers about Raqs Sharqi and Raqs Shaabi, by Morocco. Loads of interesting information in here, much of it based on Morocco’s own fieldwork. Cultural exchange and cultural appropriation – a really good blog post on the differences between the two. * I’m using the term ‘Middle East’ here as shorthand for “Middle East, North Africa and the Eastern Mediterranean”, which is a very long phrase to type repeatedly. I’m not aware of any concise term that actually refers to all the regions from which this dance originates, unfortunately. Recently, I’ve been thinking a lot about music, and how we relate to it emotionally. Since becoming a bellydancer, I’ve gradually begun to listen to more and more Arabic music, until it has become almost the only thing I ever listen to. I love the complex rhythms, the melodies that can soar majestically before diving into subtle modulations of almost infinite detail, and the incredibly emotional and beautiful lyrics. But in the last few weeks, I’ve been listening to more Western music again, rediscovering the music that is, if I’m honest, my own cultural heritage. It’s an odd mixture – music that was the soundtrack of my life as I grew up, survived secondary school, and stumbled haphazardly through university, that comforted me when life was bleak and was there alongside me during the good times. Music has always been a very important part of my life. What struck me, returning to these songs, was how many of them bring back a huge, tangled web of memories and feelings, of a place and time, weather, people I knew, places I lived, events, smells… Of course, some songs have far more of these associations than others. The most powerful are perhaps those I remember from childhood and that I still love now – ‘Lucy in the Sky with Diamonds’ for me is hot summer days in Bristol and the smell of dry grass in the mid-1990s, whereas Pulp’s ‘Common People’ is both long car journeys with my family, listening to chart music on the radio, and later (when I actually started paying attention to the words) one of the anthems of my years at university in Oxford… Others are less deep and meaningful – the songs that I’d sing along to with my friends at the tops of our voices. Everything from the Smiths to Sean Paul to Madness finds its way into this category. The point of all of this rambling is that at the moment, there are some levels on which Western music is meaningful to me and deeply affects me, which Arabic music rarely can. This is partly because of these memories of time and place and what songs have meant to me at different times in my life. Some Arabic songs are now beginning to have this effect, as my love for bellydance reaches its fifth year and this music has started to become as much a part of the fabric of my memories as David Bowie or the Sisters of Mercy. But it’s also because of the language barrier. I don’t speak Arabic beyond a very basic level at the moment (“Good morning! My name is Rachael! Please may I have some falafel?”), although I’ve picked up a fair bit of ‘dancer’s Arabic’, phrases that are fairly useless in normal conversation, but turn up all the time in love songs… With an Umm Kulthum song, I need to spend hours poring over translations and transliterations, following along with the lyrics as I listen to the song, before I can begin to appreciate the meaning. And even so, I’ll be missing metaphors and cultural references. When I listen to a Western song that I love, appreciating it is effortless, because not only do I understand the lyrics immediately, but I can also pick up on layers of meaning that aren’t apparent in a literal reading, without having to study the song for days. Taking all of this into account, I can see why some dancers feel tempted to give up on Arabic music, and dance to their favourite Western songs instead. It is easy to think, in this situation, that fully understanding and appreciating Arabic music as a non-Arab dancer is a hopeless cause, that we’ll never enjoy it as natives do, and that we might as well just do our own version of bellydance reflecting our own cultural heritage. But those of you who know me will not be surprised to hear that I don’t agree with this line of reasoning! Let’s first look at the type of response to music that I began this post by talking about. That mixture of memory, emotion and nostalgia that we feel listening to a song that we’ve known and loved for a long time. These feelings are uniquely personal and sometimes quite idiosyncratic, depending as they do on the events in your own life. So, I’ll never feel the same way about Umm Kalthum or Abdel Halim as someone who grew up in Cairo. But the thing is, no two Egyptians will feel exactly the same way about these songs either. Everyone relates to them in their own way, that comes from where that music has fitted in to their own unique lives. The question for us as Western dancers is then simply, do we have that kind of relationship with this music at all? The kind where hearing even the first few notes takes us back to past moments of joy or sadness? We may not to begin with, but after years of immersion in the music, we all develop our own relationships with it, and our own deep feelings about it. And in this context, our feelings are as valid as anybody else’s – what matters is that we have them at all. Looking more deeply at this, I do think it’s true that the music we hear in our childhoods is inevitably what gets etched most deeply into our subconscious minds. The songs we hear as children are the ones we’ll still be singing when we’re ancient and have forgotten everything else. But it’s possible to fall in love with new music from our own culture later in life, and that love is just as valid, if not more so since it’s music we’ve chosen rather than being passively exposed to. 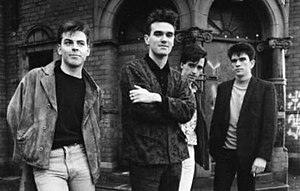 For example I didn’t discover the Smiths until I was at university – but metaphorically speaking, Morrissey and I have been through a lot together… Likewise, I don’t see that it’s any less valid to discover music from another culture as an adult. The language barrier is harder to overcome. A song may have all kinds of associations for me, but to fully enjoy it, I need to know the meanings that the writer and the singer (usually different people in Arabic music, because a great poet isn’t necessarily also a great singer) were trying to express, as well as my own feelings that colour my perception of the piece. And without speaking the language fluently, this is hard work. But it’s not impossible. You just need to spend some quality time with the song, a transliteration of the lyrics (that is, the lyrics in Arabic written in latin script so that you can read it and follow along), and a good line-by-line translation. Shira’s website is an excellent place to find these, and if you can’t find a translation online, there are also many people out there who will do song translations for you for a small fee. After listening to the song whilst following along with the lyrics enough times, you’ll begin to know which lines in the song correspond to which meanings, and be able to start feeling the meaning and intention behind the singer’s words. This is also the point where the ‘dancer’s Arabic’ vocabulary comes in handy, providing ‘signposts’ in the lyrics where you can recognise words which remind you which part is which. There are a small number of songs where I’ve now done this so often that I can follow most of the lyrics without referring to a translation, and experience the emotional impact of the song much more fully. It’s a lot of effort, but I feel it’s worth it to really get to know this incredible music. I do still feel that I’m missing something though. This is why I’ve decided to start taking Arabic classes this year – it’ll be a long time before I’m fluent enough to be able to understand a song as I hear it, but I hope that that day will eventually come. In the mean time, I’m enjoying learning to write in a new and beautiful script, and finding out about a completely unfamiliar system of grammar. However, I appreciate that learning a new language isn’t for everyone, and I certainly don’t think it’s necessary to be able to enjoy Arabic music. All of this may seem like I’m over-thinking the whole thing. And maybe I am. Because when I listen to a live Arabic band (sadly not as common an occurrence as I’d like), it doesn’t matter one bit if I don’t know all the songs or don’t understand the words. The sheer beauty and passion of the music still carries me away and sends shivers down my spine. And really, on some level, that’s all that matters.